SIlverwood Park at Open Field! Live animals on the field? Bug hunting in the Sculpture Garden? Nature Phontography? These are but a few of the many activities coming our way next Thursday, August 16th, when Three Rivers Park District’s Silverwood Park invades Walker Open Field and the Minneapolis Sculpture Garden! 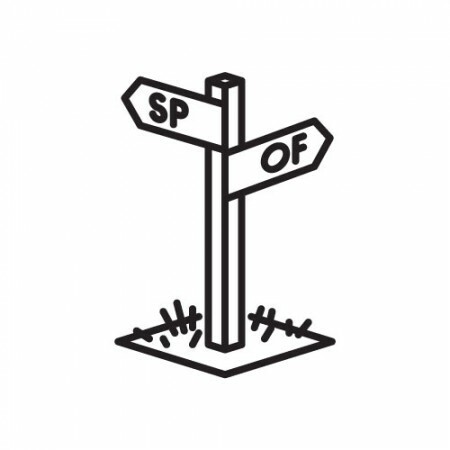 Last fall we took an Open Field “Field Trip” out to this spectacular art park in St. Anthony (which is not actually more than a few minutes from Minneapolis, seriously) and now they are coming to us! And they’re bringing all sorts of art and nature related activities. Below is a brief rundown of next Thursday’s many opportunities for natural fun as Silverwood Park and Three Rivers Park District take over Open Field and the Sculpture Garden! Our regular Open Field Drawing Club, with an animal twist. Take a pencil, a few bones, add a little taxidermy, a live animal or two and you have Drawing Club with Three Rivers Park District. Whether you start a new piece or work on an existing drawing, this session of Drawing club will be killer! There are four new sparkling faces on Open Field this summer! Come welcome them in style by creating miniatures in their likeness. Bring your own favorite stone or choose one of ours to foil in homage to Jim Hodges’ new monolithic work. Olympic fever has caught us too. Not nearly as serious as the summer games in London, a friendly competition of clay games awaits on Open Field. Individual and team events open to all ages and abilities. Delve into the nature of plant pigments and hammer out hues with plant samples from the Three Rivers Park District! Weave your work into the fabric of the park through collaborative interaction with the Sculpture Garden. Learn about raptors and explore artifacts with a naturalist from Three Rivers Park District. Make animal mosaics and survey the sculpture garden for urban animals. Come with your smart phone and pick up a treasure map. Follow the clues to find and photograph urban-dwelling natural objects. Work on your own or with a naturalist. Naturalist led-walks leave every 30 min, starting at 6:00 pm. 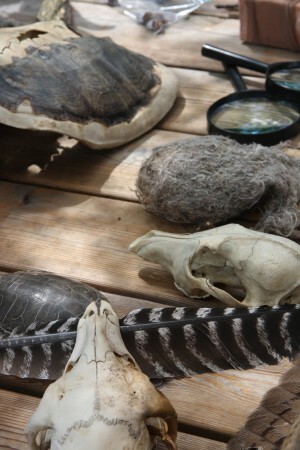 Explore different mammal furs, monarchs and artifacts with a naturalist. Make a big house and create habitats for backyard bugs. Design your own egg-laying chamber or hibernation room using simple materials including cardboard, clay tubes, sticks and more! 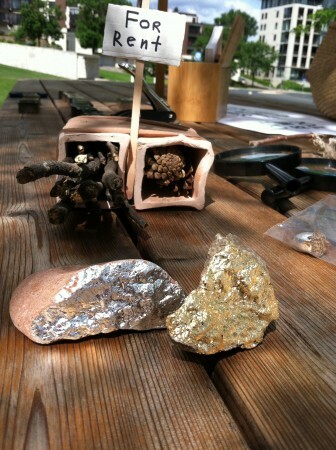 Sweep, observe and identify what insects are in the Sculpture Garden. Naturalists will be on hand to assist with identification. We hope you can make it out for this spectacular day on Open Field! Were not sure when else you might get to play with live animals, make houses for bugs, compete in clay Olympics, draw dead or alive things and explore the natural setting of the Walker Art Center all at once. And hang around after these activities wind down for Target Free Thursday Night and Acoustic Campfire performances from Lynn O’Brien at 7 pm and HOLLY starting at 8pm.